Settlements: Mid & South Great Exuma, including Stocking Island and Elizabeth Harbor. George Town, February Point, Fish Fry, Flamingo Bay, Hoopers Bay, Moss Town, Stuart Manor. Google Map of George Town / Elizabeth Harbour area with facilities and attractions. Note: Explorer Charts are available at: Top II Bottom and the Sandpiper. Exuma International Airport (GGT); 242-345-0607. Serves Great Exuma Island and the surrounding area. Moss Town. Note: cruisers recommend taking a taxi from George Town to the airport at least 1.5 hrs before the flight. Extensive air service is available at George Town International Airport from a number of scheduled airline. Taxi service is available; call on VHF Ch-16. Cruisers often offer to share taxis during the daily Cruisers' Net on VHF Ch-72. American Eagle; 242-345-0124; 800-433-7300 (US). Continental Connection; 242-345-0280; 800-231-0856 (US). Florida Air Express; 954-359-0493 (US). Island Air; 800-444-9904 (US). Charter. Lynx Air; 242-345-0108; 954-772-9808 (US); 888-596-9247 (US). Professional Flight Transport; 954-938-9508. Charter. Reggie Express Service, Inc; 954-761-3131; fax: 954-583-8547; reggiexp@bellsouth.net. Sky Bahamas Airlines; 242-345-0172; 242-300-0294. Moss Town. Southern Air; 242-3323-6683; 242-345-0607. Charter. Twin Air; 954-359-8266; charter. Moss Town. Watermakers Air; Started regular service to Great Exuma in 2016. Elizabeth Harbour is quite large and offers many anchorages that allow a cruiser to locate depending on draft, weather conditions and interests. Anchor lights are required in all anchorages. Avoid anchoring in or too near the shipping channels. Extra care is needed at Monument and Honeymoon Beach, Stocking Island, where the channel runs close to shore. Avoid anchoring in the approach channel to Exuma Yacht Club marina in Kidd Cove. Avoid anchoring in the channel along the N side of Gaviota Bay, Stocking Island. Hamburger Beach (N Monument Beach). Volleyball Beach; home of Chan 'n Chill. Sand Dollar Beach (S end of Stocking Island). Kidd Cove. Note: Keep channel to Exuma Yacht Club clear. N of Mailboat dock; be sure to anchor out of the shipping channel! Red Shanks Cays; S of George Town. Annual George Town Cruising Regatta. An annual fest of activities organized by the community of visiting cruisers. Centered around Volleyball Beach on Stocking Island. See: George Town Cruising Regatta. Annual National Family Island Regatta. Apr 25 - 29 2017. Continuing a tradition started in 1952, there will be five days of racing by ~60 traditional Bahamian vessels in 5 classes, A thru E. See: Family Island Regatta. Annual Bahamian Music & Heritage Festival. George Town Cruising Regatta. Check out this page for details of the activities of the 32nd George Town Cruising Regatta. George Town Cruiser Activities. Check this page for information on the many events organized by the community of cruisers in George Town. Elizabeth Harbour Conservation Partnership website provides information about environmental issues affecting Elizabeth Harbour as well as general information on issues relevant to those who use it. Exumas Visitors Guide. A free guide booklet available at many local businesses. 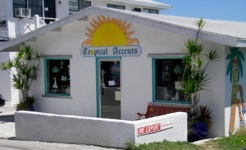 It provides a good directory of services and attractions throughout the Exumas. Exuma Tourist Office; 242-336-2430. Tourism information. Located in the Turnquest Plaza on Queen's Hwy near Immigration Office. George Town Cruising. Basic information on the George Town Cruising Regatta. Emerald Bay North Great Exuma. Sandpiper Arts & Crafts; 242-336-2084. Art, pottery. Bakery Cafe (aka Towne Cafe Bakery) Located next to Shell Station in the NW corner. Serves traditional breakfast M-F and Bahamian breakfast on Saturday. Lunch of daily specials. Popular with locals, order early. They bake bread twice a week, whole wheat on Saturdays; call to reserve a loaf. Mom's Bakery; Little Exuma. Mom used to sell her goodies out of her van but no longer comes to George Town. Her bread and pastries are available at the bakery and at Exuma Market. Home Made Goodies, HMG; Edwardo and Kimberly Beneby. 242-336-3056, edandkimbeneby@yahoo.com. Specializes in cakes, cupcakes and candies. They also sell bread, pie and delicious cinnamon buns. They can be found across from the Exuma Market on Fridays and Saturday's from 9:00 to 1:00. Manor Bakery; 242-345-2313. Stuart Manor. Watson Bakery. Don sells bread, etc. across from Exuma Market; will take orders. Fidelity Bank (Bahamas) Limited; 242-336-3391. George Town. Royal Bank of Canada; 242-336-3251. George Town. ATM. Located on S side of Lake Victoria near BTC office. Scotia Bank Bahamas, Ltd.; 242-336-2651 / 2652. George Town. Located across from Exuma Market. ATM. An affiliate of Bank of America. CNK Liquor Store; 242-336-2145. Hooper's Bay. Beer, wines, champagnes, rum, liquors. Big Mac Enterprise Wholesale Liquor; 242-345-0150. 700 Beverages John Marshall Liquors; 242-336-2771. George Town. Hours: Open Sunday. Located next to Shell station. 424 Prime Spirits; located across the road from dingy dock. A recently opened beverage store operated by Patrick an Charlene Brown. Wide selection of liquors, beer, wine. Minns Water Sports 242-336-3483 / 2604; Lake Victoria; Hours: Daily 0830 - 1700. Dive Exuma; 242-336-2893; 242-357-0313; info@dive-exuma.com. Hours: 0900-1700; Mon-Fri. 0900-1300; Sun. Located on Government Dock next to water taxis and public dock. Stand-up paddle boards, kayaks for rent. The local library offers a $3 seasonal membership. The office is located on the S side of Lake Victoria across the road from the lake. It was remodeled in 2013 and has an expanded customer service section. J&K Productions; 242-336-2566; jkproductions24@hotmail.com. Julius & Kristal offer copying; laminating; computer repairs; WiFi. Can special order computer parts. Open 0900-1700. Located 1 block SE of Exuma Market. Top up your cell phone minutes; just need phone number and $. Phone calls to the US are $0.25 / min. They have broadband internet service available if you have large files to send or receive. Forbes Enterprises Ltd.; 242-336-2857; Fax: 242-225-0139; forbesenterprise4@yahoo.com. Closed Sat & Sun. Naaman Forbes. Customs brokerage. Notary Service; Notary / Justice of the Peace located in Administration Building S of Peace & Plenty; 0830-1730; $30 fee. Airport Car Rental; 242-345-0090. Airport; Mount Thompson. Berlies Car Rental; 242-336-3290; 242-357-0305; 242-524-8321; 242-524-3852; berliescarrental@yahoo.com; edselmorton@yahoo.com. Airport; George Town. Don's Rent A Car; 242-345-0112; donsrentacar@hotmail.com. Airport; Mount Thompson. Exuma Transport at Exuma Docking Services; 242-336-2101. George Town. Joey's Car Rental; 242-357-0217. Airport; Emerald Bay. Ontime Car Rental; 242-358-5013; 242-524-2061. George Town. Sure to Shore Rent A Car; 242-336-3466. George Town. Thompson's Rental; 242-336-2442. Located across from Palm Bay Resort; will pick up at Exuma Market, George Town. Uptown Rent-A-Car; 242-336-2822. George Town. BTC Bahamas provides the only cellular service in the area. There is a large cell tower in George Town and as you cruise further N or S in Elizabeth Harbor or along the SE coast of Great & Little Exuma Islands, there is a series of cell towers that continue the excellent service. ALIV is the new cellular phone and data provider in the Bahamas. It has established service on Great Exuma as well as other major settlement areas in the Bahamas. There is an office just N of Lake Victoria near the church school on Queen's Hightway. They have provided a needed element of competition. Use BTC EZ-Top Up service to put $ on your pay-as-you-go cellphone using a credit card over the internet. In March 2018, 4G / LTE service was generally available from BTC. Top-up cards are available from many local businesses for your pay-as-you-go cellphone. Note: a new cellular communications company, ALIV, is now operating on New Providence, Grand Bahama, Abacos, and Eleuthera and is adding a welcomed degree of competition. The company has plans to expand to Great Exuma. Church of God of Prophesy. Sunday service at 1130. Jehovah Witness. Sunday service contact "Little Toot" VHF Ch-16. St. Andrew’s Anglican. Sunday service at 1100. St. John’s Baptist. Sunday service at 1100. St. Theresa’s Catholic. Sunday service at 1030. Driftwood Cafe. Located N of Library. Coffeehouse / cafe; coffee, pastries, salads, sandwiches soup of the day. Their pesto chicken salad on a cibata roll is outstanding! There is a superb cruisers net on VHF Ch-72 each morning at 0800. Vessels clearing into the Bahamas: the captain must report to the Customs Office first before going to the Immigration Office. Customs Office; Phone: 242-336-2072; fax: 242-345-0362. The Customs Office is located on ground floor of the building on the N side of the Shell Station. Immigration Office; Phone: 242-336-2569. Chief Immigration Officer: 242-376-4489. The immigration office is located on the E corner of the second floor of white 2-story Turnquest Star Plaza SE of Lake Victoria. Note 1: Cruising Permit is granted by the Customs Office for a vessel for usually 1 year. Note 2: Visas; the Bahamas limits continuous stays to 8 months maximum after which an individual must physically leave the country. Visa periods can vary from 90 days to 8 months. Note 3: For extensions / renewals of Visas, all crew who need extensions of their visas must be present at the Immigration office with their immigration / visa card to request the extension. Note: Visa Extensions will be granted only within one week before expiration. Arrive early (open at 0900; closed for lunch 1300-1400). There is a dinghy dock behind Exuma Market in Lake Victoria. It is a busy place so be sure to tie your dinghy with a long painter as a courtesy to others. Do not tie up in front of the RO water supply point except for when you are filling your jerrycans. Fill and move! Lake Victoria; Note: incoming traffic under the bridge has right of way. No wake zone. Line up with the tunnel so you can be seen. Peace & Plenty; for use by restaurant and bar patrons. Exuma Yacht Club; along inner piers; do not interfere with access to slips. Shell station in Lake Victoria for when purchasing fuel in containers. March 2012. The local government is planning to build, with the help of cruises, a dinghy dock on the S shore of Lake Victoria for use when filling propane, etc. Redshanks Area. A private boat ramp has been built that provides ready access to Chetah's and the Mecktan Plaza. The owner tolerates use by dinghies that do not interfere with ramp operation. Note: these locations are approximate but fairly close; use good judgement. AID / NAPA: Store: N 23º 31.46'; W 75º 47.48' Beach access point: N 23º 31.40'; W 75º 47.42' There is a short path from beach to road; ~ 200'. Turn N.
Baranki Wash: Store: tore: N 23º ; W 75º Beach access point: N 23º ; W 75º Landing is a bulkheaded area; not particularly tender-friendly; use caution. Prime Island Meats & Deli: Store: N 23º 31.70'; W 75º 48.73'; Beach access point: N 23º 31.74; W 75º 48.52' Beach access path to road; ~300+'. Turn N.
Fish Fry. Along the shore at: 23º 30.85' N; 75º 46.90' W. Take your dinghy in to the shallow beach just S of the grounded & derelict "Arctic Circle" tug and barges. Smitty's Convenience Store & Pharmacy: Store: N 23º 31.79'; W 75º 47.88'; Beach access point: N 23º 31.69'; W 75º 47.62' Path from beach to road is just S of home. Turn N.
Stocking Island Queens Dock (access to Monument): N 23º 31.85'; W 75º 45.99' Old cruise line pier now maintained by cruisers. Path to beachs and monument. Respect property of home built back from the beach. Sun Oil (propane): N 23º 31.21'; W 75º 47.18' Dinghies can be landed on a beach N of Palm Bay Beach Resort; walk to road; head S to first road to R (W); follow road to BEC plant. Santana's Restaurant & Mom's Bakery, Little Exuma: N 23º 25.75'; W 75º 33.68' It is possible to anchor a larger vessel offshore in settled weather; exercise great caution. Take a rental car. Tropic Breeze Restaurant, Little Exuma: N 23º 30.97'; W 75º 47.28' It is possible to anchor a larger vessel offshore in settled weather; exercise great caution. Take a rental car. See: Environment & Ecology for Cruisers. Protect the fragile reef ecosystem: take extra care when anchoring dinghies near reefs while snorkeling. Bird Watching; for information on good sighting spots in the protected land parks and mangrove swamps contact Exuma Tourist Office; 242-336-2430. Cruising Biologists: marine biology: www.cruisingbiologists.com. Gayle and Bill on Spiraserpula, an Endeavor Cat 44 publish a website with great information about local reefs, snorkeling and marine biology. Ecotours: Exuma Cay Adventures; 242-357-0390;242-336-2353; 242-551-8044; eaparadise@batelnet.bs. George Town. Ecotours: Exuma Watersports;; 242-336-3422. George Town. Ecotours: Roberts Island Adventures; 242-357-0224; robertsislandadventures@msn.com. George Town. Live Green / Recycling: See Recycling. Police & Fire Emergency: 919. There is no true Farmers Market in the area. However a number of residents grow vegetables and offer them for sale around George Town. 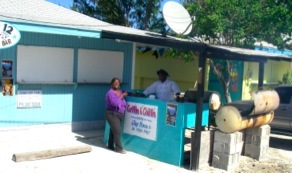 Mr. Rooseelt offers fresh vegetables across from Exuma Market on Mondays, Wednesdays, and Thursdays; ~ 0800 - 0930. John Paul offers fruits and vegetables including delicious local tomatoes at the Baptist Church. Williams Farm. Fresh vegetables grown in Barraterre. in town near Exuma Market on Tuesdays and Fridays. Yvon's Produce. Located at the Straw Market. Fresh tomatoes and other produce. Water Taxi; VHF Ch-16 & 14; 242-464-1558; Elvis. Service between government pier in Kidd Cove to & from vessels n anchorage to Chat 'N' Chill, George Town, Volleyball Beach, Hamburger Beach, Stocking Island and other locations in Elizabeth Harbour. Service includes early and late pickups from vessels to meet air connections; Elvis is punctual and can be relied upon. $15 / person roundtrip; ask about boaters' special. Bahamas Ferries; 242-336-3456. There is high speed catamaran ferry service to Nassau. Four C's Adventures; 242-464-1720; 242-345-2352; clayton.p.smith@live.com. Ferry services. Note: Spearfishing is prohibited in Elizabeth Harbour. Four C's Adventures; 242-464-1720; 242-345-2352; clayton.p.smith@live.com. Deep sea fishing; reef fishing. Roberts Island Adventures; 242-357-0224; robertsislandadventures@msn.com. George Town. Reef fishing. Styles Sea Food; Frozen sea food available in Trainee's Beauty Salon; 242-336-2620. Across from Shell gas station. Exuma Yacht Club; 242-336-2578 / 2101. Has diesel and gas available at its fuel pier. Hours: 0900 - 1500. Water also available, $0.40 / gal. Note: 3 Mar 18; Exuma Petroleum has taken over the lease of the property. A new gas station, convenience store and fuel pump on pier are to be installed over the next few months. Marshall's Shell Station; NW of bridge to Lake Victoria has gas and diesel. There is a dinghy dock available in Lake Victoria while fueling. Hours: Sunday 0900-1200; 1400-1700. Minns Water Sports sells fuel for its rental boats only at the NE corner of its dock. Bal Sound's Taxi; 242-525-0832; 242-357-2375; 242-336-2905; VHF Ch-16. Rents scooters; $100 deposit; $35 / half-day; $50 / day. Prestige Scooter Rental at Top II Bottom; 242-357-0066. Administrators Office: 242-336-2166 / 2177. Ministry of Tourism; 242-336-2430. George Town. Driftwood Cafe; 242-336-3800; driftwoodcafegt@gmail.com. Sells grass-fed organic beef selections. E&L Meats & Grocery; 242-336-3434. Hoopers Bay. Exuma Markets LTD; 242-336-2033; Fax: 242-336-2645.. Hours: Monday-Thursday 0800-1800; Friday - Saturday 0800-1900; Sunday 0800-1100. 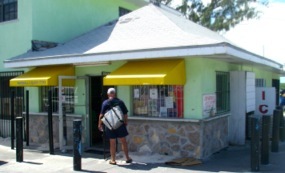 This is the best grocery store in the Exumas with a wide selection, fresh and frozen meats, deli, fresh produce. They maintain convenient dinghy pier on Lake Victoria behind the market with free RO water to fill jerry cans. Store offers a bulletin board for cruisers and will accept and hold mail and packages for cruising boats. George Town. Fresh produce is offered by local residents at the Straw Market and along the main street. See Farmers Market above. 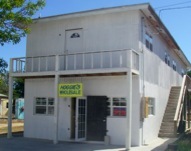 Hoggie's Wholesale. Offers a limited selection in large size packages of major brands. Marshall's Snack Supplies; 242-336-3390. George Town. Peanut Man; Darin dark roasts peanuts fresh daily. He sets up shop across from the Customs building; usually from 1000 on. Prime Island Meats and Deli; Located N of George Town. A real butcher shop and deli. Recently expanded (2018) store and includes a larger grocery selection. In 2018 they discontinued weekly van rides from town. Access: taxi; hitchhike; by boat — see Dinghy Access. Shop Rite Mart; 242-336-2670. S side of Lake Victoria. A full service grocery store with a large selection. Closed Sundays. Smith's Food Supply; 242-345-2315. Stuart Manor. Smitty's Convenience Store; 242-336-2144. Well stocked with groceries & household items. Hoopers Bay near Darville Lumber. By boat — see Dinghy Access. Taylor Grocery; 242-336-2566. George Town. Elizabeth Harbourmaster: Elvis; VHF Ch-16; 242-464-1558; 242-336-2312. Note: Cruisers should clear in and out by contacting the Harbormaster. Information needed: vessel name, country of origin, last port of call, registration or documentation number. Office hours are 0900-1700, M-F. Located in round brown building near mailboat dock. Boats at anchor must display anchor lights (white visible 360º for 2 nm). Dinghies traveling at night must display a light. No anchor buoys are to be used due to danger presented to boats moving at night. No spearfishing in Elizabeth Harbour (Exception: lion fish may be speared whenever encountered per Harbourmaster). Direct discharge of sewage is prohibited and here is a fine of up to $4000 for discharge of sewage in the harbor. AID / Auto & Industrial Distributors LTD; 242-336-2780. George Town. NAPA; north of town. Darville Lumber; 242-336-2980 /2114. Located about 3 mi. N of Lake Victoria is the local "Home Depot". Exuma Building Supplies; 242-336-2402. Hoopers Bay. Top II Bottom Hardware; 242-336-2200. Hours: 0900 - 1800; Mon - Sat. This is a small store just N of Exuma Market that offers an amazing variety of hardware, marine, electrical, plumbing, fishing, and home supplies. Cozy Corner Delicatessen; 242-336-2532. 16 flavors of Edy's. Located 4 nm S of Lake Victoria in the Mecktan Plaza on Old Airport Road. Accessible by dinghy at Redshanks. There are many WiFi hotspots available in George Town. But over time hotspots available to the anchorages have become almost non extant. In 2017, the best method to get internet connectivity is via cellular internet service. Club Peace & Plenty restaurant offers free WiFi to patrons. Eddies Edgewater Restaurant & Bar; offers free WiFi in the front bar but not dining room..
J&K Computers; 242-336-2566. Hours: 0900-1700; M-Sat. $5/day; $15/week. Long distance phone service; printing; laminating, fax service. Mel's Place Deli and Internet Cafe; 242-336-3010. Located in the blue building on the NE side of the bridge at Lake Victoria. Free internet access to cafe patrons. Baranki Wash; 242-336-2332; 242-524-8511. Hours 0600-1900; 7 days a week. Bright, clean, 20 washers 16 driers; $2.50 / load for washer or drier. Located S of Lake Victoria in the Mecktan Plaza at Old Airport Road. Call Ricardo for pickup from Exuma Market; they will pick up you and your laundry and bring you back when done. Accessible by dinghy at Redshanks, a circuitous route past February Point, under the Crab Cay bridge and then the winding channel to shore = take your chart on your smartphone. There is a bulkheaded area where you can land a dinghy (a bit of a challenge). See Lat Long under Dinghy Access. Lee's The Corner Laundromat; 242-336-2094; Hours: 0830-1700 Monday through Saturday; closed Sundays. Located on side street E of J&K Computers. Can arrange for your laundry to be washed, dried and folded and kept separate. Snacks & cold drinks are available. Exuma Cleaners; 242-336-2038. Laundry can be dropped off at Forbes Enterprises (near Exuma Market) from 0800-1000 and will be returned washed, dried and folded by the end of the day. Exuma Yacht Club; 242-336-2578. For patrons. Located across from Straw Market. Book swap with $3 seasonal membership for cruisers. A selection of DVD is available. Foreign language & marine books available. Club Peace & Plenty and Beach Inn; 242-336-2551; 800-525-2210; info@peaceandplenty.com. George Town. Coastline Condominiums; 242-336-2890. Hoopers Bay. 2-BR fully furnished condos available by the day, week and month. Exuma Palms Hotel; 242-358-4040. Waterfront efficiency rooms with balconies; restaurant and bar. Three Sisters Beach. Higgins Landing; 242-357-8888; stockisl@aol.com. Stocking Island. Kevalli House Marina & Cottages; 242.357.0118; Stocking Island. Offers two guest cottages for rent. Marshall's Guest House; 242-336-2694. George Town. Mount Pleasant Suites Hotel & Villas; 242-336-2960. Hoopers Bay. Palm Bay Beach Club; 242-336-2787; 888-396-0606; info@palmbaybeachclub.com. George Town. 1, 2, 3 Bedroom villas; 2 pools, beach; bar & grill. Peace & Plenty Bonefishing Lodge; 242-345-5555. The Ferry. Pineapple House, Stocking Island has a houseboat for rent in Hole 1; includes dinghy. Contact on VHF Ch-16. Regatta Point; 242-336-2206. Kidd Cove, George Town. St. Francis Resort & Marina; 242-336-2416; 242-557-9629. Stocking Island. The Cays; 242-336-2299; rentals@greatexumacays.com. Home rentals. Two Turtles Inn; George Town. Located N of Shell gas station. Note from personal experience: All regular mail flows through Nassau where it can be held up for extended periods of time (seemingly at random) before it is sent on to the out-island destination. There are several more reliable and timely ways to get mail shipped to George Town; but more expensive. Mail (that does not contain purchased items) is not subject to customs duties. Method 1 from US: Ship mail to Reggie Express office in Ft. Lauderdale: Reggie Express Service, Inc; 954-583-8545; fax: 954-583-8547; reggiexp@bellsouth.net. Address to your name / your boat name, C/O Reggie Express, 2968 Suite #111, Ravenswood Road, Ft. Lauderdale, FL 33312. After your package has been received at Reggie Express, call to prepay the shipping charges. There is a minimum fee of $20 for up to 8 lbs; 8-lbs and above is $1.75 / lb. Doe Boi Unlimited is the local representative for Reggie Express. Shipments from US are once a week on Wednesdays. They are available for pickup at Doe Boi Unlimited on Wednesday afternoon or Thursday morning. See more information under Packages & Shipping, below. Method 2: Mail deliveries can be arranged by having the package shipped via DHL to their local agent, Top II Bottom in George Town. See more information under Packages & Shipping, below. There is regular mailboat service. There is regular freight boat service. Crab Cay; marina / resort on Crab Cay, SE of George Town, under development. Exuma Yacht Club; 242-336-2578, 2579; VHF Ch-16. 52 slips, electricity, water ($0.20 / gal at pier); gas, diesel, oil, laundry, showers, ice, restaurant, liquor store, car rental. Dockmaster: Clevon Gray. Manager: Rufus Gray; rgrayj@yahoo.com. The marina reports the ability to accommodate a 7.5' draft at the fuel pier; vessels with draft > = 6' should approach at mid-tide or better due to a low spot in the channel. A restaurant is in operation on the upper deck of the marina office. Minns Water Sports 242-336-3483; Lake Victoria. Small boat marina. St. Francis Resort & Marina; 242-336-2416; 242-557-9629. Stocking Island. Offers moorings. Kevalli House Marina & Cottages; 242-357-0118; kevallihouse@gmail.com. Stocking Island. A marina specializing in boat storage on moorings and slips in Hole 3 (N-most) a "hurricane hole". Short or long term. On site manager to watch over clients vessels. Contact: Bob. Marina at Emerald Bay; See Emerald Bay. George Town Marine & Repair Ltd.; 242-345-5116; Master’s Harbor. 50-ton travel lift, haulout, storage. Note: Jan 2012, a boom truck can be rented by the hour for mast work. Brown's Auto Marine Repair; 242-336-2883 / 3330. Located S of Lake Victoria across from Chetahs. Extensive marine supplies and new dinghies in stock. Darville Lumber; 242-336-2980 / 2114. Located about 3 mi. N of Lake Victoria is the local "Home Depot". Minns Water Sports 242-336-3483 / 2604; Lake Victoria; Hours: Daily 0830 - 1700. Yamaha outboards; marine supplies and parts. AID, NAPA Autoparts Store. Located N of George Town. Super Sea Marine; 242-336-2882. George Town. Super Sea Marine; 242-345-2319. Stuart Manor. Top II Bottom Hardware; 242-336-2200; offers a reasonable selection of marine supplies. Bottom Cleaning: Jonathan at Dive Exuma; 242-524-5011. Brown's Auto Marine Repair; 242-336-2883 / 3330. George Town. Marine Surveys. Deatra Cole; 242-357-0900; amsbahamas@outlook.com; is an experienced ABYC & SAMS licensed and insured marine surveyor living in George Town. Minns Water Sports 242-336-3483 / 2604; Lake Victoria; Hours: Daily 0830 - 1700. Lake Victoria. Service for Boston Whaler, Glacier Bay. Dealer for Yamaha and Suzuki outboards. Outboard service mechanics available. Outboard Service: Mario; 242-467-0884. Independent contractor. Outboard Service: Vernon's Outboard Repair; 242-464-1748 / or contact thru Elvis on Water Taxi. Welding: Patrick at Sammonet next to Eddies Edgewater is available for welding at $80 / hr. Government Medical Clinic / Hospital; 242-336-2088. Doctor, nurse. Hours 0900-1700; Monday - Friday. A new large and beautiful medical clinic has been built just N of town in the Fish Fry (old WW II navy base); the large white roof can be seen from across the harbor. Two doctors and nursing staff are available; the pharmacy is in operation. X-ray equipment not in operation. Cruisers who have used the clinic have found the medical staff and support personnel to be caring and the facility to be spotless. Walk-in service available. There is a $30 service. Note: if the staff believe the problem is beyond the capabilities of clinic, the cruiser will be referred to medical assistance in Nassau. Exuma Dental Services; 242-358-4584. The doctor is from Nassau. Dr. Fuzzard; 242-358-4584; 242-424-0148 (text). Located at Farmers Hill Clinic. Smitty's Drug Store; 242-336-2144; fax: 242-336-2146. Located about 3 mi. N of town. This is the only pharmacy in the S Bahamas. John, the pharmacist, gets twice-weekly shipments of prescription drugs from Nassau. While he keeps a good stock of standard pharmaceuticals he may not stock special combinations available in the US. Your doctor can phone or fax in a prescription. If it is special, the doctor can consult with John by phone to see what alternatives may be available through Nassau. Elizabeth Harbour Port Department has installed ~16 moorings in Gaviota Bay, Stocking Island. Kidd Cove harbor moorings are for use of Bahamas Houseboats. Kevalli House Marina & Cottages; 242.357.0118; Stocking Island. Offers moorings and slips in Hole 3 (N-most), a "hurricane hole", for boat storage; not for live-aboards. St. Francis Resort & Marina; 242-336-2416; 242-557-9629; Gaviota Bay, Stocking Island. Offers 15 moorings with free wifi. Wendell "Little Toot"; 242-357-0703; VHF Ch-16. Has 6 moorings in Gaviota Bay and Hole 2, Stocking Island. He also has moorings for long term boat storage in Hole 3. Redboon Cafe. Music Monday and Friday nights. Two Turtles. Karaoke Tuesday nights. Note: Dinghies entering Lake Victoria have the right-of-way; line up well outside so you can be seen by those waiting to exit. There is a 3 mph speed limit in Lake Victoria. Take care not to anchor in the ship channel. Special care is needed at Monument Beach, Honeymoon Beach anchorages where the channel runs close to the W shore of Stocking Island. The channel into Exuma Yacht Club / Kidd Cove must be kept clear to allow vessels to safely make the approach and exit to the piers. A program began in 2013 to improve navigation aids in Elizabeth Harbour. Cruisers are invited to make status reports and suggest improvements. See Navigation Aids. Bimini Shipping. Ships from Miami to George Town. Broker: Forbes Enterprises. Cruisers needing to get items shipped to them while in the Bahamas should read the general information: Shipping Items. Deans Shipping; 242-336-4324 / 4424. George Town. DHL: Top II Bottom Hardware; 242-336-2114. Packages should be addressed to the Yacht / person ℅ Top II Bottom Hardware. When the recipient is notified of a tracking number, it and a copy of the vessel's cruising permit should be provided so Top II Bottom can fax it to Nassau. The package will go through Customs in Nassau and must have a copy of the invoice and the vessel's cruising permit for inspection; including a letter of explanation is useful. After arriving at the airport, they are brought to Top II Bottom. There is a handling fee. There is a Stamp Tax of $25 on shipments. DHL: J&K Productions; 242-336-2566; jkproductions@hotmail.com. Doe Boi Unlimited; 242 336-2329; doeboiunlimited@gmail.com. Dejuan or Lilly are agents for Reggie Express Services. FedEx: In March 2013 Exuma Markets was accepting FedEx shipments. Packages should be addressed to the Yacht / person ℅ Exuma Market. The package will go through Customs in Nassau and must have copy of invoice and the vessel's cruising permit for inspection; including a letter of explanation is useful. After arriving at the airport, Taxi 16 picks them up and delivers them to Exuma Market for a $10 fee. Forbes Enterprises Ltd.; 242-336-2857; Fax: 242-225-0139; forbesenterprise4@yahoo.com. Closed Sat & Sun. Naaman Forbes. Customs brokerage. Are agents for UPS. They can arrange for shipment of items from US to George Town by air or by ship; contact for ordering, clearing, delivering parts. J&K Productions; 242-336-2566; jkproductions24@hotmail.com. Julius & Kristal offer a service from Sarasota FL through Nassau to George Town via DHL. They are agents for DHL. Contact for more specific information. Florida office: 305-677-2904. Reggie Express Service, Inc; 954-583-8545; fax: 954-583-8547; reggiexp@bellsouth.net. FL contact: Regina, Don, Gareth. Packages shipped to the FL office [2968 Ravenswood Road, Suite #111, Ft. Lauderdale, FL 33312] will be shipped by air on Wednesdays to the George Town Airport. They will handle customs with paperwork you provide (invoices, cruising permit, etc.). Ship item to Ft. Lauderdale office; when you have receipt confirmation, call Reggie Express to prepay shipping fee. Local contact is Dejuan or Lilly at Doe Boi Unlimited; 242 336-2329. UPS Agent: Forbes Enterprises Ltd. is the agent for UPS (Feb 2012). Allyah's Nail Gallery & Beauty Spot; 242-336-2311. George Town. Brianne's Unisex & Nail Source Centre; 242-336-2330. George Town. Located on 2nd floor of yellow-orange building across from church S of Exuma Market. Fabulous 'D' Beauty Salon; 242-345-6236. Stuart Manor. Kayvannah's Hair Affair; 242-336-2140. George Town. Lumina Point Resort Spa; 242-357-0099; 242-357-0712; info@luminapoint.com; massages. Massage by Brenda; 242-524-6565. Specializing in relaxation massage. Michelle's Hair Care; 242-345-2347. Stuart Manor. My "T" Fine Beauty Salon; 242-336-2295. George Town. Original Lines Barber Shop; 242-336-3239. George Town. Peace & Plenty Spa; 242-336-2551; 242-524-2309. George Town. Special Touch Massage, 242-554-2922. Nitza Rolle. Located next to Corner Laundromat. Clean & pleasant salon. Highly recommended a cruiser. Trainee's Beauty Salon; 242-336-2620. George Town. Vanria's Salon & Spa; 242-455-6167; 242-357-0115. Located above Royal Canadian Bank in the Turnquist Star Plaza SE of Lake Victoria. US trained; provides cuts, colors, massages. George Town requires pets to be on a leash. Pick up you pet's "deposits"! 242-336-2666; VHF Ch-16. Office in government building. George Town. U.S. Army; 242-336-2623. Flamingo Bay. U.S. Embassy / DEA Strike Force; 242-336-2580. George Town. Post Office; 242-336-2636. Open 0830-1600, M-F, does not close for lunch. Located in Government Building, George Town. Air mail arrives daily. Post Office will hold mail for boaters that is not specifically addressed to Exuma Markets or addressed to General Delivery. Exuma Markets; 242-336-2033; Fax: 242-336-2645.. Will accept and hold mail and packages for cruising boats. George Town. Address mail to yacht / intended recipient’s name; c/o Exuma Markets, George Town, Exuma, Bahamas. Forbes Enterprises; George Town. Will receive and hold mail and packages. Address mail to yacht / intended recipient’s name; c/o Forbes Enterprises, George Town, Exuma, Bahamas. See Mail above for more information on shipping flat mail to George Town. Island Gases; 242-357-0245. Clarence; brings the propane truck to the S shore of Lake Victoria on Wednesdays after 1000 during the cruising season. This may change if the truck is being refilled. Announcements are made Wednesday mornings during the Cruisers Net on VHF Ch-72 about the truck being available. Forbes Enterprises; Closed Sat & Sun. Located S of Exuma Market in George Town. Drop off tanks and pick up next day (by 1000 for same day pick up @ ~1600). They transport tanks N to be filled and charge for this service. Harbor Service Boat; VHF Ch-18; 242-354-2058; Rodney. Accepts gas bottles for refill. Hail on VHF Ch-18. Sun Oil; 242-336-2051. Located near BEC power plant N of George Town. Bring tanks and have them filled while waiting. Accessible by dinghy; see Dinghy Access above. Note: Propane is delivered to Great Exuma by shipping the tanker truck to Nassau for refilling. During this process, propane refills are sometimes unavailable. The Elizabeth Harbourmaster states that use of holding tanks and the pumpout boat are mandatory for cruising boat as direct discharge is prohibited in Elizabeth Harbour. There is a fine of up to $4000 for discharge of sewage in the harbour. Elizabeth Harbour pumpout boat was sunk by Hurricane Matthew in 2016 and is no longer in service (March 2018). The Marina at Emerald Bay is the only pumpout service available in the Great Exuma area. There are many ways to assist the local community and meet many wonderful Bahamians. Tutoring: The children at the local school in George Town benefit greatly from one-on-one tutoring in reading. Cruisers meet M, W, F from 1000 to 1200 at the Library. They then go next door to the school and bring back children to read with. Recycling of Bahamian beer bottles (Klick, Sands, Guinness) are the only items recycled of April 2016. Note: there is no recycling for other glass containers or cans. Recycle at: Symonettes, the auto service station on the S shore of Lake Victoria. Recycle at: L&L, white truck just S of Exuma Markets. Place recyclable beer bottles in a separate bag and place next to truck. Club Peace & Plenty; 242-336-2551; 800-525-2210; info@peaceandplenty.com. George Town. Inn, resort, spa, pool restaurant and bar. Named for the ship that brought Lord Denys Rolle to the Exumas in 1783 and founded by a grand-nephew of Henry Flagler. As of March 2018, new owners have taken over and are upgrading the facilities and services. February Point Resort Estates; 242-336-2661. February Point. In February 2016 a beautiful new restaurant, bar, and pool opened. Higgins Landing; An eco-resort located on Stocking Island on the S end of Volleyball beach. March 2016: has ceased operations and is for sale. Lumina Point Resort; 242-357-0712; 0999 A new eco resort on Stocking Island S of volleyball beach; opened in Spring 2016. Features 12 cottages, a bar and gourmet restaurant overlooking the S hole. Palm Bay Beach Resort; 242-336-2787. Located N of George Town. Hotel, restaurant, bar, pool, beach open for cruisers. Go by dinghy; the beach is huge and an attendant is on hand to watch your boat while you have fun. Check with the manager to use the pool when the resort is not full and you stay for lunch or dinner. Blu at Exuma Yacht Club; 242-336-2579; VHF Ch-16. Restaurant & bar on upper deck at Exuma Yacht Club overlooking the harbor. Catch A Fire Bar & Grill; 242-357-0777; Sunset Bluff, Hermitage, Moss Town. Open Tuesday to Sunday; live music on Wednesday & Saturday. Rake & Scrape on Saturday night. Candy Island. Located across from Exuma Market. Offers sweets, coffee. Castaways #2 Restaurant & Bar; 242-345-0248. Moss Town. Chat 'N' Chill Bar & Grill; 242-357-0926; 242-336-2700; VHF Ch-16. Volleyball Beach, Stocking Island. 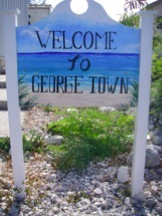 A George Town cruisers institution and hub of community activities. Restaurant, bar, conch salad bar; open 1100 - 1900 daily. Sunday pig roast, 1200-1900; ~$20. Advice: come early or you'll miss the pork! ); also, great ribs. Wednesday night: barbecue chicken; 1800. Have a beer, meal & enjoy beach volleyball. Cheaters; 242-336-2535; 242-524-8511; VHF Ch-16. George Town. Offers Bahamian foods by Norma. Open for breakfast on Saturday; lunch and dinner daily from 1000-2200 with daily specials. Located 4 nm S of Lake Victoria. Accessible by dinghy at Redshanks on beach across from restaurant: 23º 28.8' N; 75º 45.0' W. Call 242-336-2535 or on VHF Ch16 for to arrange for a pick up by car from Lake Victoria. Club Peace & Plenty; 242-336-2551; info@peaceandplenty.com. George Town. Offers a great restaurant and pool bar open to cruisers. Serves breakfast, lunch, and dinner in restaurant overlooking harbour. Check out their great breakfasts. Bar on pool deck serves lunch. Free WiFi. Happy Hour daily 1800-1900. Tasteful Thursdays: grilled ribs, steaks, chicken etc from 1800 on; Rake & Scrape: 2000 - 2300; Drink specials. Cozy Corner Delicatessen; 242-336-2532. Subs on 8" baguettes with choice of 8 toppings. Located 4 nm S of Lake Victoria in the Mecktan Plaza on Old Airport Road. Accessible by dinghy at Redshanks. Driftwood Cafe; 242-336-3800; driftwoodcafegt@gmail.com. Located N of Library & school. Uruguayan & Bahamian fusion coffeehouse / cafe; shady outside patio; friendly staff; serving great coffee, capucchino, expresso, pastries, salads, soups, sandwiches, entrees. Open 0730-1500 Monday - Friday; 0730-1400 Saturday. The food is great and the outdoor courtyard is a lovely place to dine. Eddie's Edgewater Restaurant & Bar; 242-336-2050. SW shore of Lake Victoria, George Town. Open 1000-2200; serves breakfast, lunch, dinner (1800). Rake and Scrape Mondays 2000 to 2300 weekly. Free WiFi. Exuma Palms Hotel; 242-358-4040. Restaurant and bar. Three Sisters Beach. Exuma Point Beach Restaurant Bar & Grill; 242-345-6244. Rolleville. A beachside restaurant and bar on a beautiful beach at the NE tip of Great Exuma. Open on Saturdays and Sundays from 1200 on. Features an all-you-can-eat buffet. August Rolle. Pier is accessible by shallow draft vessels / catamarans. Foxy's Pizza; 242-332-1504. Mt. Thompson. Flamingo Bay Club; 242-336-2554. Flamingo Bay. Honey Dew Restaurant & Bar; 242-336-2933. Fish Fry. Julian's Jerk Chicken & Ribs. Take-0ut in small green building located in parking lot just NE of the Lake Victoria bridge. Jerk chicken and pork ribs. Fridays and Saturdays 1200 - 1600. Lumina Point Resort; 242-357-0999; The Beacon Restaurant: Monday – Saturday: 1800-2200; Sunday: 1100-2300. The Lookout: Bar: Monday – Sunday: 1000-2000; Grille: Monday – Sunday: 1100-1800. Kermits Airport Lounge; 242-345-0002. Airport. Serving Bahamian dishes and home of the "Best Ham & Cheese Sandwich". Mariella's Pizza & Ice Cream; 242-336-4400. Emerald Isle Shopping Center. Mel's Place. Located across from Shell Station in NE back corner of blue Traine's Salon building. Serving Bahamian breakfast & lunch specialties. Palm Bay Beach Resort; 242-336-2787. Located N of George Town. Hotel, restaurant, bar, pool, beach open for cruisers. Located N of George Town and the settlement of Fish Fry, the resort is easily reached by dinghy from the anchorages along Stocking Island; while there is a small pier, the resort is located on a large beach where there is plenty of space to beach a dinghy. Ron, the proprietor has a staff member who watches over the dinghies of customers -- so you don't have to worry about the dink going walkabout. 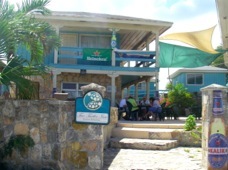 The resort has a large bar and dining room and offers daily specials. There is a beautiful pool and deck that can be used by paying bar and dinner patrons - check with Ron. Peanut Man; Darin dark roasts peanuts fresh daily. He sets up shop across from the Customs building; usually from 1000 on. He also offers local coconut oil for sale. Santanna's Bar & Grill; 242-345-4102. Williams Town (see Little Exuma I). Has some of the best food in the Bahamas, simple, fresh, delicious! Shoreline Restaurant & Bar; 242-345-6201. St. Francis Resort & Marina; 242-557-9629. Stocking Island. Tino's Deck Restaurant & Bar; 242-336-2277. Fish Fry Naval Base. Tino's Lounge; 242-336-2838. George Town. Towne Cafe; 242-336-2194. George Town. A bakery and restaurant offers bread, sweet rolls and serves breakfast & Lunch. Located in the NW corner of the gas station. Restaurants & Bars at Fish Fry: AKA "Da Fish Fry"
The Fish Fry area is located about 1.3 nm N of Lake Victoria. The area grew up many years ago as a place where a number of small bars and restaurants congregated as a place where local residents could go for good meals and drinks, for lunch and dinner and gather for parties nights and weekends. There are several great restaurants and bars here. Several places are open for lunch so visit and check them out to select one for dining. Location: 23º 30.85' N; 75º 46.90' W. Take your dinghy in to the shallow beach just S of the grounded "Arctic Circle" tug and barges. Aces Simply Native Restaurant & Bar; 242-336-2973. Asha Recreation Restaurant / Bar & Grill Pit. 242-336-3242. Charlies Restaurant & Bar; 242-336-2107. BBQ Chicken & Ribs. Karaoke. Grillin & Chillin with Chef Bowe; 242-425-7823; chefbowe@gmail.com. Great BBQ ribs, shrimp, chicken, jerk pork; steak fish, lobster. Catering. Hailies Place; 242-336-2342. Healthy choices; pastries. Kendal's Restaurant Bar & Grill. Out Deck Restaurant & Bar; 242-336-3079. Shirley's. Offers 2 for 1 lunch seafood specials Monday - Thursday 1100 - 1500 for ~$12. Ting Um Dem. Bar and grill. Balsound Electronics; 242-336-2375 / 2385. Club Peace & Plenty and Beach Inn; 242-336-2551; Boutique. Doe Boi Unlimited; 242-544-9091. Electronics and cell phone sales; cell phone unlocking; DVDs. Agent for Reggie Express Services. Da Bahamian Closet; 242-336-3059; denisemoss47@gmail.com. New in 2012 this boutique offers colorful Bahamian batik fabrics and clothing by Androsia. Exuma Business Center; 242-336-3271. Stationery, copies, internet access point. George Town. Electronic Bazaar & Supplies; 242-336-2040. Hooper's Bay. Erika's Floral Designs; 242-464-1938. George Town. Exuma Electronics; 242-336-4170. George Town. Exuma Hair Beauty Supplies & Accessories; 242-336-3319. George Town. Exuma Home Center; 242-336-2374. George Town. Exuma Supplies; 242-336-2506. George Town. Garden Creations Center; 242-336-2380. George Town. Guys & Dolls; 242-336-2582. George Town. Janet's News Stand; 242-345-0072. Airport. KC Florist & Basket Creations; 242-336-2160. La Tiffs Jewelry & Repair; 242-336-2711. George Town. Lashawna's Discount Store; 242-336-3244. Hoopers Bay. Marina Nik-Naks; 242-336-2748. George Town. Marilyn's Gift Shop; 242-336-3321;lericedames@hotmail.com. George Town; New in 2011. Offers authentic Bahamian souvenirs many from the hands of Lerice Dames the proprietor. Marilyn's Gift Shop; 242-345-0324;lericedames@hotmail.com. Exuma International Airport. Offers authentic Bahamian souvenirs many from the hands of Lerice Dames the proprietor. Optimum Office Supplies & Disposable Products; 242-336-3396. La Familia Plaza. Pet Store & Harbor WiFi. Located just NW of N Lake Victoria bypass. Rolle's Airconditioning & Refrigeration; 242-345-5183. New in 2013: a retail store for household items, small appliances, and tools. Sandpiper Arts and Crafts; 242-336-2084. George Town. Offers a wide selection of delightful and quality clothing, gifts, books, art. Explorer Charts for sale. Located NW of Lake Victoria bridge across from Peace & Plenty. Sheanda's House of Essence; 242-336-2869. George Town. Starfish Boutique. Offers a wide assortment of gifts and decorative items. Located NE of Lake Victoria bridge. Sophisticated Nail & Beauty Supply; 242-336-2890. George Town. Straw Market. Bahamian goods and handcrafts including handmade baskets and hats. The original Straw Market was located at the N end of Regatta Park but burned down ~2014. It was relocated to a tent located across the street from Administrative Center and Regatta Park. In March 2018, a new permanent masonry building is nearing completion. The Coin Store; 242-345-4043. Williams Town. Top II Bottom Hardware; 242-336-2114. Offers a wide variety of housewares, hardware, and marine supplies. Touch of Elegance; 242-336-2730. George Town. Tropical Accents & Gifts; 242-336-2396. George Town. Cuban cigars. Universal Fashion; 242-336-4222. La Familia Plaza. Do not clean fish and dispose of fish waste in the harbor — it attracts sharks! Showers are available for guests at marinas and resorts. The best information on snorkeling in Elizabeth Harbour is available on the wonderful website Cruising Biologists which provides information on snorkeling & marine biology. Gayle and Bill on Spiraserpula, both marine biologists, on an Endeavor Cat 44 publish the website. There is a good snorkeling site at the S end of Elizabeth Harbour in the cut between Fowl and Guana Cays. There are buoys to moor a dinghy. Small fish will greet divers expecting a handout so come prepared. Dive Exuma; 242-336-2893; 242-357-0313; info@dive-exuma.com. Hours: 0900-1700; Mon-Fri. 0900-1300; Sun. Located on Government Dock next to water taxis and public dock. Morning dive trips and afternoon snorkel trips, PADI dive courses, private charters, gear rental, scuba tank fills. Exuma Scuba Adventures; 242-336-2893. George Town. Exuma Watersports; 242-336-3422. Snorkeling tours. Four C's Adventures; 242-464-1720; 242-345-2352; clayton.p.smith@live.com. Snorkeling tours. Minns Water Sports 242-336-3483; Lake Victoria. Peace & Plenty Water Sports; 242-336-2225. George Town. Roberts Island Adventures; 242-357-0224; robertsislandadventures@msn.com. George Town. Snorkeling; Cast-a-ways tours.. Turtle Divers; 242-524-3305 (Garvin); 242-524-2495 (Nick); 242-357-0607 (Nick). George Town. Travel from George Town to the Airport takes ~30 min. Recommend arrival at airport ~2 hrs before flight. Ask taxi driver for advice. Taxi fare to / from airport: $30 / 1 person; $35 / 2 persons plus gratuity. Numerous local taxis can be contacted on VHF Ch-16 (Ch-14 is working channel). Listen to Cruisers Net for opportunities to share taxis to the airport. Bal Sound Taxi; 242-525-0832; 242-357-2375; 242-336-2905; VHF Ch-16 (Taxi 23). Bal Sound sponsors the men's and women's softball teams. Exuma Travel & Transportation / Exuma Transit Services; 242-345-0232. Airport. Leslie Dames Taxi Service; 242-357-0015. Luther Rolle Taxi Service; 242-345-5003. Taxi 13; Leslie. Pleasant and reliable. Taxi 16; 242-357-0410; 242-336-2116; VHF Ch-16. Clifford Strachan. Taxi 57; J.J.'s Taxi Service; 242-524-7443; VHF Ch-16. James "JJ" Rolle. See Area Events above for information about major events. See George Town Cruiser Activities for a list of regular events and specials offered by local businesses. Bush Medicine Tour: Christine Tours; Christine Rolle; 242-358-4016. College of the Bahamas, Exumas Centre; 242-336-2792. George Town. Cruisers Regatta Week an annual event is not to be missed. Exuma Cay Adventures; 242-357-0390;242-336-2353; 242-551-8044; eaparadise@batelnet.bs. Hoopers Bay. Glass bottom boat tour. Tours of: Exuma Cays Land & Sea Park, Elizabeth Harbour, Exuma and Long Island in high speed excursion boat. Kite Surfing: Exuma Kite Surfing; 242-524-0523. Exuma Tours; 242-336-3297. George Town. Exuma Watersports; 242-336-3422. Safari tours to norther Exumas including Staniel, Compass, Fowl Cays, Thunderball Grotto in high speed tour boat. Hiking on Stocking Island. There are several trails that give hikers access to most of Stocking Island. It is possible to walk the entire ocean (E) beach of the island. Trails will take you up to Monument Hill and a couple of other high spots where spectacular views of Elizabeth Harbour. A regular cruising visitor, Skip Hird on SV Eleanor M, has drawn an excellent map of the trails for the use of hikers. Skip also maintains these trails. See: Stocking Island Trail Map for download. Skip asks hikers to heed the advice he provides on the chart to help preserve this fragile environment. See George Town Cruiser Activites. Kayaking: Palm Bay Beach Resort; 242-336-2787. Off Island Adventures; 242-554-2768. Kite boarding; out-Island adventures. Kayaking: Starfish Exuma Activity Center. Regatta Park. Home of island festivities: annual Music Festival; Family Island Regatta, etc. Roberts Island Adventures; 242-357-0224; robertsislandadventures@msn.com. George Town. Tours; snorkeling; reef fishing Cast-a-ways tours. Seaside tours: Bill Curtis; 242-357-0270. Sailing: Starfish Exuma Activity Center. Sightseeing: Guided tours with Christine (Taxi 25), Mary (Taxi 10). Starfish The Exuma Adventure Center; 242-336-3033. George Town. Tennis: public courts are located at February Point. As with most places in the Bahamas, local tides are referenced as a time offset from those at Nassau. Tide (Elizabeth Harbour) = Tide (Nassau) +10 to 30 minutes . 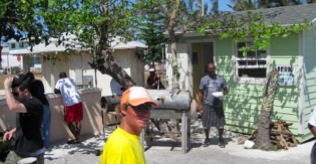 Trash Truck: Les operates a pickup truck located on the S side of Exuma Market and the dinghy dock. Will accept trash bags: $2 for small bag; $3 for large. In 2018, this is the only place for cruisers to dispose of garbage. Cruisers should not use dumpsters of private businesses, those in town or those along the beaches to dispose of boat trash. Cruisers should avoid paying individuals for trash disposal as they end up putting it in unauthorized sites. Recycle: There are no longer recycling receptacles. Note: The free trash dumpster at the mailboat pier available in former years are no longer available. Harbor Service Boat is no longer in operation; it was sunk by Hurricane Matthew. 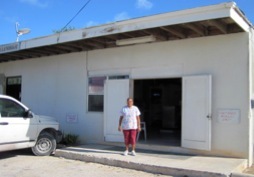 There is no longer a veterinarian resident on Great Exuma. Bahamas Humane Society; Exuma; 242-557-8838; bhsexuma@gmail.com. The BHS Exuma is located in the 2-story green building, Bahamas Sound 18, located N of George Town on Queens Highway; just pas AID/NAPA. To get there by boat see Dinghy Access, above. Note: Contact this BHS office for information as there are sometimes other veterinarians that become available on an irregular basis. VHF Ch-68 is the hailing channel for Elizabeth Harbour. Cruisers should use this channel in lieu of VHF Ch-16. Cruisers should use the "USA" set of VHF channels on their radios in the Bahamas. International or Canadian frequency sets have more duplex channels which complicate local communication. Local residents and business use VHF Ch-16 extensively; it is still used for emergency traffic. Cruisers should reserve use of VHF Ch-16 for emergency use and use VHF CH-68 for hailing. VHF Ch-14 and Ch-12 are allocated to use by local businesses in this area by the Public Utilities Commission. The trash truck located S of Exuma Markets will accept waste oil in a sealed container placed next to vehicle; check sign for fee. The Symonettes service garage just W of the Batelco office accepts waste oil for $3/gal. Free RO town water is provided for filling jerry cans courtesy of Exuma Markets from a spigot on the dinghy dock in Lake Victoria. RO town water is available at Exuma Yacht Club pier for $0.40 / gal. Note: 2 Mar 18, water is available at the pier. Coral Springs; 242-336-2830 / 2831. George Town. Bottled water. 2016 George Town Derecho. Check out video of unusual weather front, a derecho, that hit Elizabeth Harbour in January 2016. George Town Derecho Video.